Light cube, originally uploaded by SwappyIT. I love playing with Light(and words) and varied household artifacts. This is just one of those Shots, Was sitting alone after a wholesome day at work, for a change I had some quality code to do :). 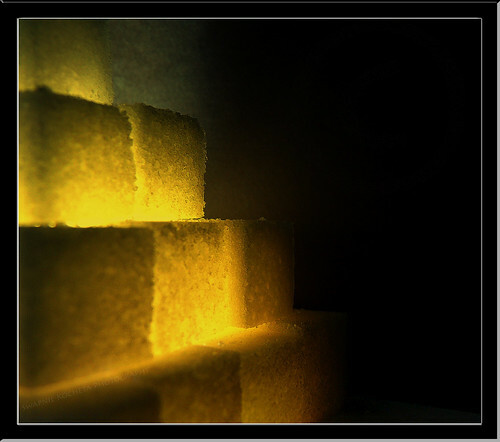 Had just brought back some whole grocery, and the Sugar cubes struck me. Stacked them up like a child would do, Building castles in the air, Shapes, Patterns, and finally the light. Clicked some 20+ clicks, none came as perfectly as expected, but this one had a positive feel about it, The leading lines from bottom right to top left, the cubes, lines, texture, highlights melting into the shadow. 20 Sugar cubes, 1 torch light,2 White cardboard sheets and a lot of Patience. Added Frame, Bevel, Increased Shadow, Contrast, Added Slight Glow and Signature.